Recently awarded the 2018 Louisiana Attraction of the Year Award, this trip offers a 1-hour private carriage which is perfect for couples or small families who are looking to experience the French Quarter in the most authentic way. Ride through the historic neighborhoods of New Orleans and discover the amazing history, culture, and architecture of the French Quarter with your local, professional, and licensed guide who will be guiding you through one of the most vibrant neighborhoods in America with the help of his trusted carriage mule. Learn the basics of New Orleans history and discover fascinating anecdotes about the people and places that have contributed to making the city truly unique and unforgettable. This is limited to 4 people. The Carriage is boarded at the carriage stand located at 700 St. Louis Street, across the street from the Omni Royal Orleans Hotel and the world-famous restaurants, Brennan's & Antoine's. Once your private carriage arrives, hop aboard and ask your carriage driver to take a picture of your group. The carriage tour will be 1-hour in duration, traveling through the French Quarter and Faubourg Marigny. 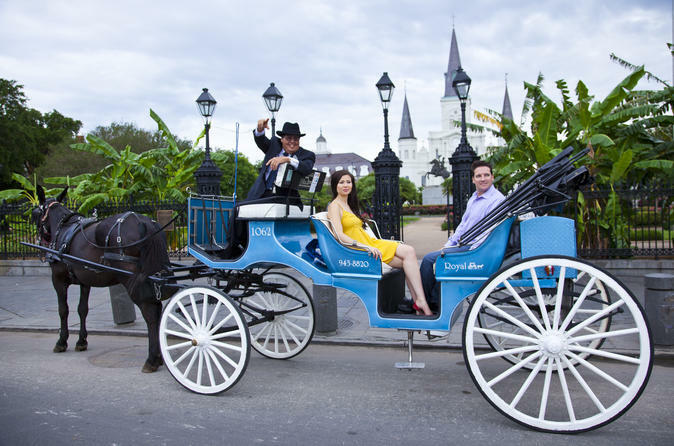 Your private mule-drawn carriage will roll past iconic New Orleans landmarks and locations, such as the Louisiana Supreme Court Building, the Napoleon House, Jackson Square, The Saint Louis Cathedral, The French Market, Bourbon Street, Royal Street, and more. The guides are top-rated, local, professional, and licensed through the City of New Orleans. There are no set routes or scripts. Cherish the uniqueness of the tour guide's tours and personalities and encourage them to let their passion shine through their curated tour information. With that being said, the Tours provide passengers the opportunity to customize the carriage tour information to suit the needs. If you have a special tour request, make sure the carriage driver knows right away. The private carriage tour may be able to visit St. Louis Cemetery if the reservation is scheduled between the hours of 9am-2pm, Monday - Saturday. "Can you make sure to tell the history of the fantastic food?" "Can you bring to the haunted house?" "Can you show where the locals go for live music?" "Can you take a romantic and quiet route?" "Can you show multi-million dollar mansions?